During dark, stormy nights there's only one place in Neovia where one can find some warmth, company and a glass of cider: the Twilight Tavern. A little, shy Biscuit Kacheek named Maruyna is walking down the narrow, cobbled street that leads to it. She's a foreigner and doesn't even like the town that much, but she really needs to relax a bit after her long travel. Once she steppes through the thick, wooden door she's introduced into a big square room. For a few brief moments, her eyes can only discern a fireplace opposite the door, some torches along the walls and several small flickering oil lamps, one for every table. This obscure light is an intentional system of the Tavern owner to allow those within to gain recognition of strangers who enter before they can see the patrons. Maruyna has to use some time to adjust her sight to the obscure light; the first thing she notices is the large wooden counter, where many patrons drink and talk together. Her attention is then drawn by the table at the exact opposite corner of the entrance; there there are some shady figures seated around it gambling on some game of chance. She walks towards the counter and, once she reaches it, asks the waiter (innkeeper?) for some hot beverage. Once she's been served, she leaves some coins on the countertop and starts looking for a place where she can sit down. In a few moments she realizes that every table is taken and her only chance to relax and drink her beverage is asking someone if she can sit down at their same table. There's a lonely, pale Ghost Aisha seated near the fireplace and Maruyna decides to approach her. "Good evening, Ma'am. I'm sorry to disturb you, but every table is taken. May I sit here with you? I promise I'll make my business, I won't be nosy and..."
The Aisha doesn't even let the Kacheek end her sentence, just briefly replies, "I generally don't accept other people at my table, but I like you. So, please, sit down and enjoy your drink." Maruyna looks at her interlocutor, quite astonished for a brief moment and then accepts her invitation and sits down. 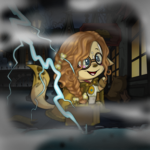 Stealing a glance at the Aisha, the Kacheek notices that she doesn't have those scary red eyes as every other Ghost pet, because she's wearing some icy blue contacts which give her a comforting appearance. After some minutes of silence, the Aisha beckons Maruyna with her left paw and says. "If you come closer, I'll tell you my secret. Don't be shy! I told you I liked you, after all." So, without saying a word, the simpleton, curious Kacheek leans towards her interlocutor, ready to hear what the Aisha has to tell her. "Nobody knows my real name, they simply call me Amyufi." In the brief pause after her saying, Maruyna would like to introduce herself too, but she suddenly feels it's better not to interrupt the Aisha's chat. Amyufi continues her story. "I love shiny, sparkly things. Most of them cost too much though, and I don't have all those financial means, if you catch my drift. 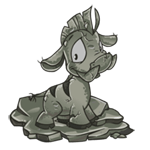 I know what you're thinking about: I should find a tedious job and save my hard earned neopoints to reach my goals. However, it would be incredibly boring and uninteresting, and I'm the kind of Aisha who gets bored easily. So, I chose the other way." Her voice has now become a whisper. "I am a thief; but please, don't be afraid. I promise, I'm always nice, polite and I have never hurt anyone in my life. I was inexperienced at the beginning, obviously. I entered the Thieves Guild to learn the basics of this art, and I have to admit I was taught very well; among all the novices, I was the one most interested and excited because I knew the potentials of this profession. My recurring thought during that period was: «If I became an expertly skilled thief, I could achieve every jewel, piece of art, relic or anything else I want»." Amyufi stops talking for a moment, and drinks a sip of wine from the glass in front of her. Then continues her conversation with a normal tone of voice. "I started roaming the streets of Neopia Central, especially the market, just after the end of the base course: the task for novices was to provide meals for the Guild. I was caught on my first try and I learned the most important lesson; if you look silent, hesitant and suspicious, the shopkeeper observes you with more attention and there's a good possibility that they'll catch you in the act. So I understood - I needed to change my approach; I became friendly and loquacious without exaggeration, careful not to draw so much attention that the merchant could remember my features quite well and accurately describe me to the guards. The other novices and I started bringing the Guild many different foods: fruit, vegetables, meat, cheese and so on. We were doing our best in providing meals to the others, and I haven't been caught ever again." Maruyna feels like she is hypnotized and can't divert her attention from Amyufi, who keeps telling her story. "One day, I came back to the hangout with a big, fat blue Chokato. It is a very rare fruit coming from Mystery Island and the only merchant who has this kind of fruit in the Neopia Central market is very well known for their sharp-eye and intolerance for thieves. There are rumours that he knows very well how to knockout anyone who tries to steal from his shop and that he learned his techniques at the Ninja School during one of his journeys on Mystery Island. When the Guild veterans and Kanrik – the Guild master, I'm sure you know him by his name – noticed the blue and brown fruit in my hands, asked me how I managed to steal that Chokato. I explained my technique; it was the third day of the month, the half-price day, and the shop, as everyone else, was actually crowded. I remained in the shop for more than two hours, constantly hidden by the other people - who were pressing each others to be served first. I patiently waited for the right moment. When the merchant served a very beautiful and flashy Draik, I noticed he only had eyes for her eyelashes and I took my opportunity; I have already been close to the basket containing Chokatos and nobody seemed to be interested in me, so I grabbed one in a twinkling and I made it slide in my purse. After that, I grumbled with an annoyed tone: "This shop is too much crowded. It's been ages since I entered here!". Someone followed my complaint and started complaining too, so the shopkeeper had to calm people down and I managed to go out the shop without being noticed. Kanrik clapped his hands, satisfied by my job, and he instantly promoted me." There's a satisfied smile on Amyufi's lips now. She's obviously still very proud of herself for the achievement she earned. "I was a novice no more, but an effective member of the gang. I started attending to the advanced course within the Guild, and I learned to play an appropriate role for different situations, so – for example, I could look like a simple silly girl or a sophisticated, cultured lady depending on the type of environment I was in. I think that the best part of the course was the disguise course. Faces, and eyes in particular, are the most recognisable features; altering your appearance with the proper and matching use of masks, make ups, face paints, contact lenses and glasses is very useful if you don't want to be identified... and caught, obviously. I became a master of disguise very soon: I started collecting every useful wearable piece, including fake beards, moustaches, monocles and helmets; I learned the best use of eyeliners, blushes and eye shadows for my appearance-altering purposes. Yesterday I was a very old man with a long white beard and a hunchback, today I could be a glamorous lady with long eyelashes and a beauty mark near the mouth. And tomorrow, who knows!" The Aisha chuckles amused, taking her left paw to her face to hide her mouth. "I left the Guild many moons ago. I'm a solitary girl and I don't love working in a group and dividing what I obtained with my 'hard' (ha! piece of cake!) work with others. I have to go now. Thank you for listening my story and... for this gorgeous golden pendant you had!" Amyufi suddenly stands up and walks fast towards the exit. Maruyna doesn't even try to chase her, still dazed by the Aisha's tale. She just puts her paws on her chest instinctively feeling that her necklace has gone for real. You could swim away, but we're on land.